Posted on April 27, 2017 at 7:06 am. lly put in a very risky scenario. Not only they are living a life with comfort issues, but they can also be susceptible to health problems due to allergens. Of course, anyone who has a faulty air conditioner or furnace would be happy to ask for a repair service as soon as possible. However, making rush decisions when hiring a professional HVAC contractor can make you vulnerable to unreliable HVAC people, or worse, scam artists. Here are simple tips to ensure that you’re getting the right HVAC contractor. Nothing beats a well-educated customer. Smart customers know what they actually want and need, ask the right questions, and they aren’t easily ripped off. The internet provides everything you need when it comes to anything about HVAC. You can check customer reviews and certifications of different HVAC companies. With a huge investment such as an HVAC, it is necessary to try every available tool. Sure thing, there’s a lot of homeowners and business owners out there who have had a new air conditioner or furnace installed, or serviced by a local HVAC repairman. Talk to your family, friends, and other people you know about their overall experiences with different HVAC companies around the town. Don’t undervalue the opinion of a reliable source. Start talking to people now! After getting some leads from your homework and referrals, you should have a clear idea on how to narrow down your preferences. Speak to your candidates and check who can give you a good impression of their business. Their attitude in dealing with potential customers is a strong indication of how they will cater your needs all throughout the process. Some people assume that the cheapest price is the best option. Unfortunately, it’s not the case with HVAC. Remember that HVAC units are complex and it takes a highly trained and experienced technician to perform efficient installation, repair, and service. While checking the price of the equipment is advisable, you should pay attention to the skills of the installer. Get the details in writing. It’s always best to request several quotes from different local contractors. Before you say yes to the cheapest company, be sure that you have taken a closer look at the promise behind their job. One caveat: one of the signs of unreliable HVAC service or scam artist is a low price. Be sure that your potential contractor offers maintenance programs in order to keep your unit in great shape all year round. Don’t be hesitant to ask for details regarding their annual or seasonal maintenance plans. Besides, keep in mind that warranty can be voided by improper maintenance. If you need a dependable HVAC company in Longview, TX, it’s always best to do your research. 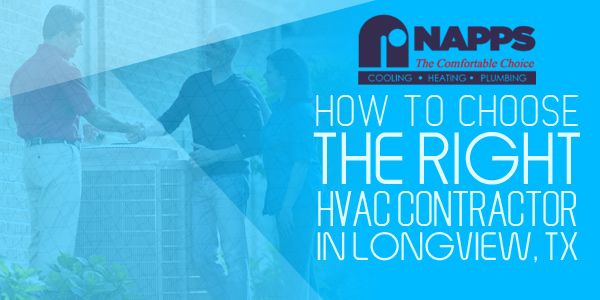 By knowing what you need and what to look for in an HVAC contractor, you can be confident that you’re making the right choice.